A.P. noted the relative small number of pre-1875 fifths. I'll start this little exercise and plan to make changes for awhile. Help me with the dates of service and colors. Here is the listing of fifths and flasks that were in service prior to 1875. Some came and went before 1875, others started before '75 and carried on somewhat longer. I tried to list the 5 colors that I would consider if I was collecting a grouping of each of these bottles. Green - truly green. Yellow Green is a click or two more toward yellow. 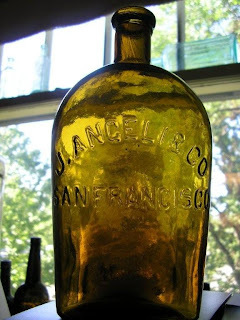 Yellow Amber - light amber shades (pure yellow coloration is rare). Old Amber - Plain ol' amber, sometimes with the olive amber shade. Dark Amber - Very dark, chocolate amber or dark olive amber. 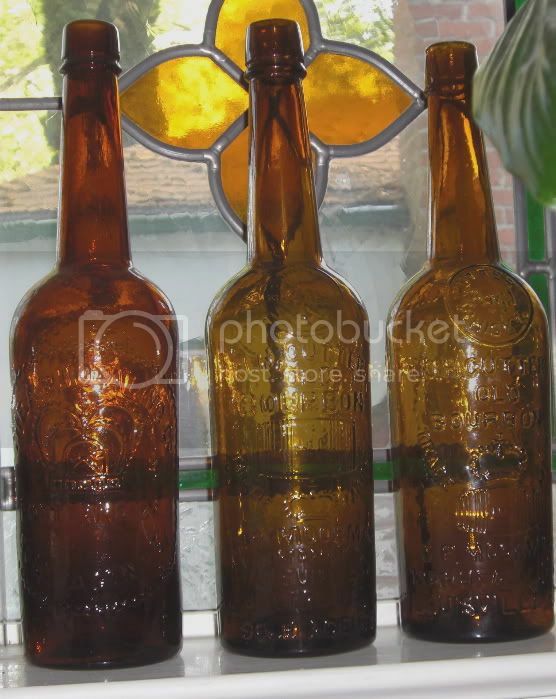 You can find several shades of yellow amber and old amber if you are collecting the Circles or Star in Shields. I don't want to split hairs, my point is trying to identify the very few fifths and flasks that come in the 'full rainbow' or all 5 colors. The Teakettle has the royal flush + 1 (the joker) aqua. Dates I have used are from Thomas, or my own estimation or guess. 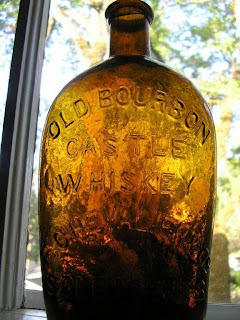 Dating whiskey bottle usage, exactly, -to quote 'old cutters' - is a s.w.a.g. 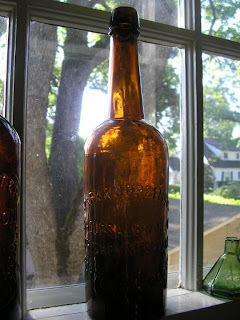 The bottled product, in cases or in the consumer's hand, is not subject to spoilage. Wholesalers and retailers had no worries about the product going bad. Inventory was kept on hand until sold. 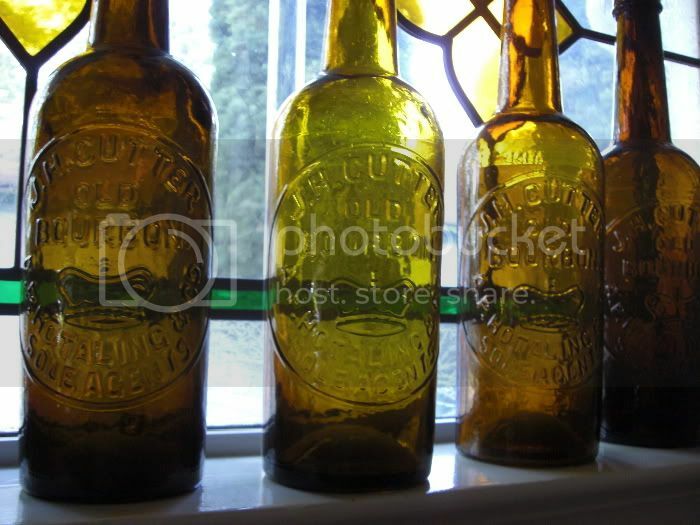 The Cutter bottles in particular were constantly changing. 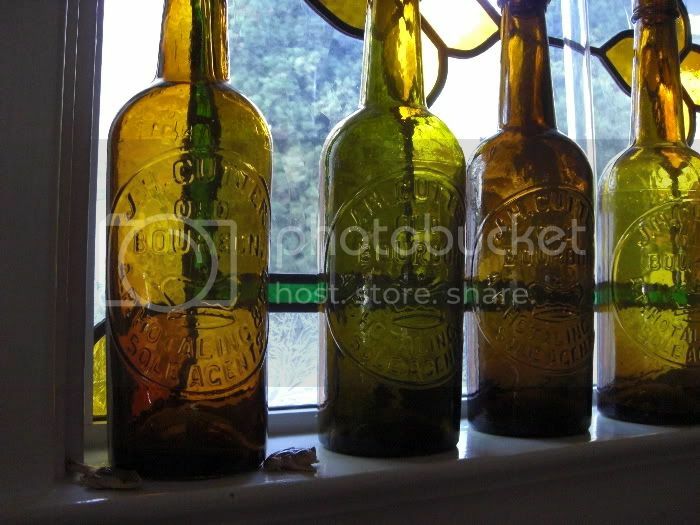 There had to be some overlap in bottle usage, possibly a couple of years in some cases. Please give me direction if you think some date changes need to be made, or if you have seen examples of bottles in colors that I have a question mark next to. Post a comment or email me, thanks. Thos. Taylor Virginia, N.(t-151) 1871-1877? * I believe the C&I variants are a bit newer, 1877-1879 or so. or so. We need more info on the four C&I fifths. Would make a nice article. Here are a couple of pictures that Dale Mlasko just sent me. 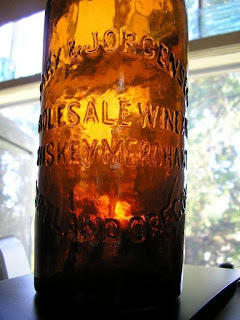 This is an ultra rare glob fifth, Marx and Jorgensen Wholesale Wine And Whiskey Merchants Portland, Oregon(t-112). There are only two examples known, and this is the stronger of the two examples. 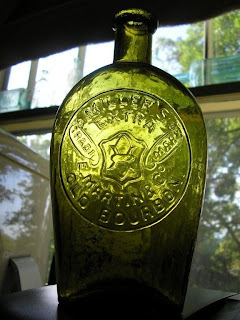 Marx and Jorgensen were in business in Portland for quite a few years, but this embossed glob fifth was probably made and used for just a year or two in 1879-80 or so. A rare bird and certainly one of the top Oregon bottles. I am putting up quite a few posts, will come back and put some more dialog. Dale is sending me some flask picts. 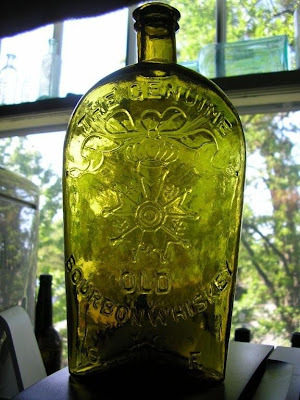 and I know we all like to look at killer bottles. This filthy whittled, frothy example was recently acquired from a digger south of San Francisco. 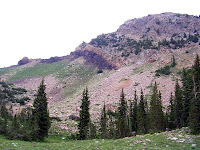 Same example as upper right. Here is another Cutter related sign to look at. 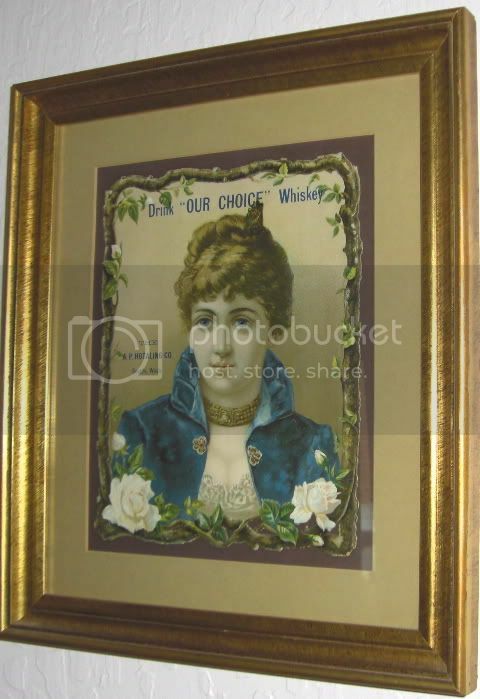 This one is on metal, with the C.P. MOORMAN & CO. LOUISVILLE, KY. on the frame. 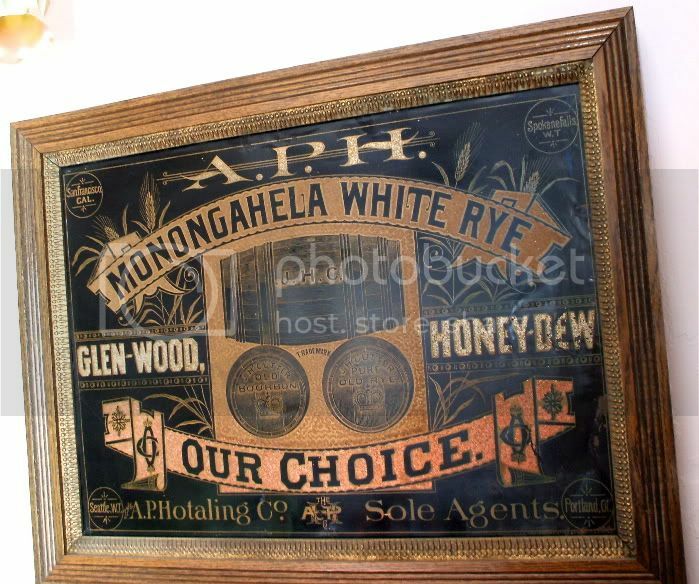 Love these signs, next to impossible to find.. or afford! Picked up this copy of the Old Bottle Magazine, Aug. 1971, a few days ago. I remember when it came out, with John Thomas witching for bottles. I guess no one ever perfected that art!! Here is John Thomas holding court in 1997 at the great Whiskey Extravaganza - Downieville Bottle Show. John passed away in 2000. 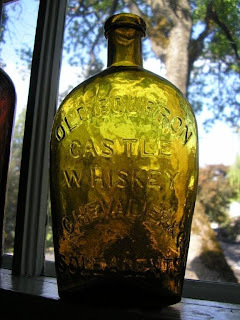 He was instrumental in bringing glob top whiskey bottles and collectors together with his first book (booklet) A Choice Listing Of The Most Desired Older Whiskey Bottles. 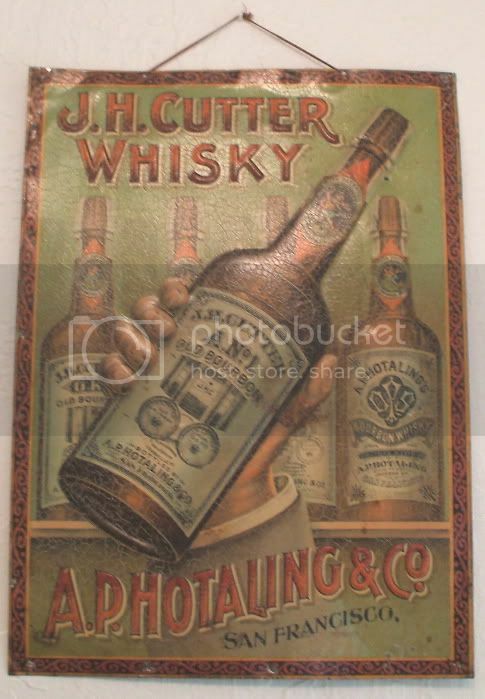 Shortly after A.P.Hotaling opened his offices, bottling rooms, and warehouses at 429&431 Jackson St in 1866 he began bottling the famous J.H Cutter Whiskey that was discussed in such great detail by G.O.Blake. 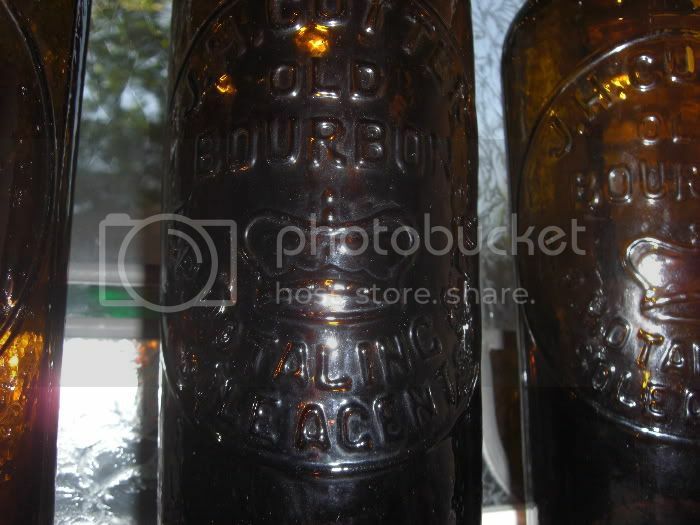 Following the Open Face, or N0n-Crown, bottle was the one referred as Shoulder Crown. 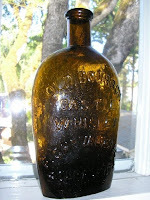 This bottle first appeared in 1871 and likely continued to be produced until sometime mid decade. 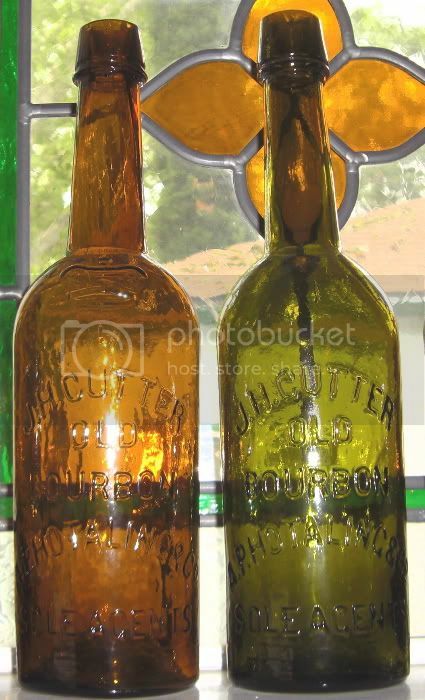 Unfortunately, the earliest Cutter trademarks were stolen from the State Archives many years ago, so dating these bottles is subjective at best. 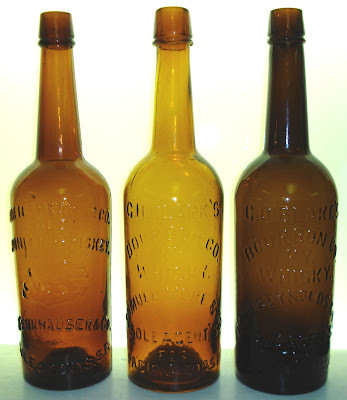 Following are two examples from my minor collection of Hotaling's bottles.